HMS Avenger was a 10-gun wooden steam frigate originally rated first-class, later reduced to second-class. Built in Devonport she was laid down 27 August 1844 and launched on 5 August 1845. The image below was published in The Illustrated London News shortly after launch day. 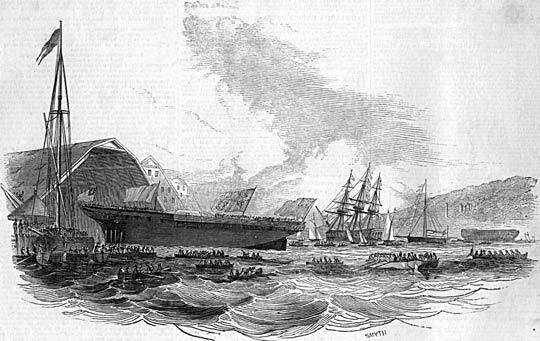 The caption below the original print was: 'Launch of "The Avenger," steam-frigate, at Devonport. In addition to the dignitaries invited to every ship launch at Devonport there were typically thousands of residents, onlookers and well-wishers always present. As was tradition, those residents of the town with boats would take them onto the Hamoaze to celebrate and give the ship a good send off - as captured in the image. www.wrecksite.eu/ Accessed 29 August 2012.